The job market last year was one of the toughest in recent memory. Despite signs of a reviving economy, employers continued to cut positions, especially in sectors such as construction, manufacturing and government. But other professions, such as technology, saw less drastic cuts. 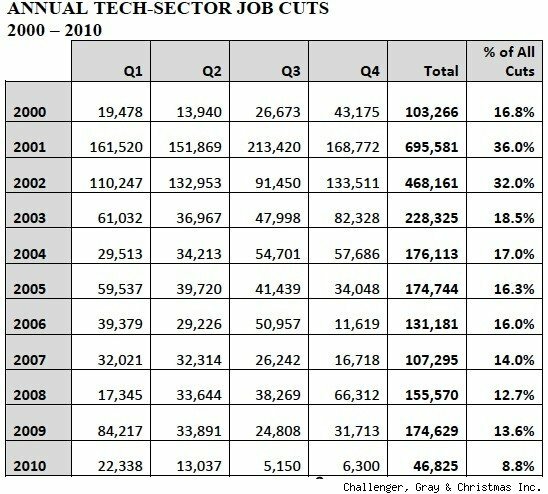 After losing nearly 175,000 jobs in 2009, the number of planned layoffs in technology fields fell to just under 47,000 last year, the lowest yearly total for the sector since 2000, according to a report released Monday by employment-services firm Challenger, Gray & Christmas. The 73% decline in tech job layoffs signals that tech employers -- which include computer, electronics and telecommunications firms -- are recovering more quickly from the economic downturn than employers in other sectors, Challenger CEO John Challenger said in a written statement. "Many industries are still struggling, even as the economy recovers," he said. But a surge in demand by companies worldwide to replace or upgrade aging computers and other technology has put the tech sector on the leading edge of the recovery. "The surge in smart phones and tablets alone is helping to drive growth in electronics, telecom and computers," Challenger said. Industry analysts expect the tech sector to continue its recovery in 2011, Challenger noted. A recent survey by the trade publication InformationWeek, showed that 55% of information technology professionals said their companies will increase information technology spending in 2011, while only 19% expect it to fall and 26% expect it to remain unchanged. Further, forecasts by Forrester Research show that IT spending this year is expected increase 7.5% in the U.S. and 7.1% worldwide. Though technology jobs suffered huge losses in the early part of the last decade -- nearly 700,000 positions in 2001 alone -- during the next 10 years, the sector is forecast to experience one of the fastest paces of job creation of any industry. 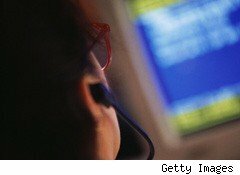 The number of network systems and data communications analysts, for example, is expected to increase by 53% by 2018, while the number of computer software engineers is projected to grow by 34%, according to the Bureau of Labor Statistics. Still, Challenger cautions that successfully seeking employment in 2011 will take grit and determination. "Finding a job is never easy, even in the best economy," he says, noting that despite the potential for improved hiring this year, competition remains stiff, and employers continue to be picky about the specific aptitudes and experience they're looking for in new hires. That means job-seekers, including technology workers, will have to keep their skills updated to remain competitive. Further, Challenger says, "It may also be necessary to expand one's search to more industries or geographically."